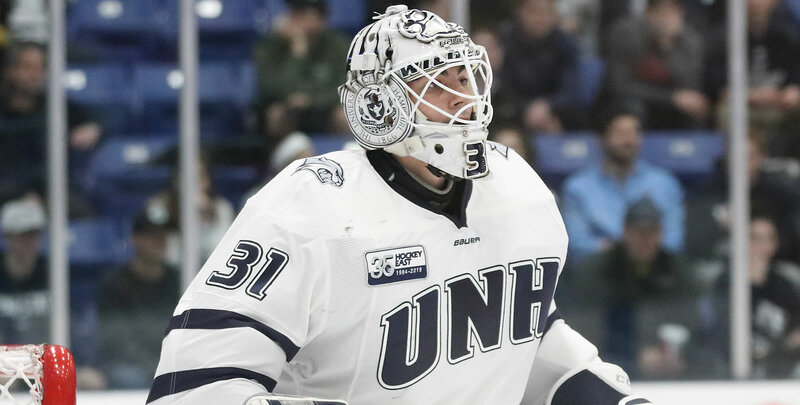 DURHAM, N.H. - Six different Wildcats scored a goal and 13 posted at least one point as the University of New Hampshire men's hockey team defeated UConn, 6-0, on Saturday night at the Whittemore Center. With the victory, the Wildcats are now 7-1-3 over their last 11 games. UNH improves to 9-8-8 overall (5-5-5 HEA) while the Huskies fall to 7-15-2 (2-11-2 HEA). UP NEXT: The Wildcats will take on Maine in a White Out the Whitt Weekend on Friday and Saturday, Feb. 1-2 at 7 p.m. The game on Friday is presented by UniFirst and the fourth set of the trading card series will be given out to the first 1,000 fans. Then the game on Saturday is presented by Kennebunk Savings Bank as white pom hats will be the giveaway. You can buy tickets by calling the Whittemore Center Box Office at (603) 862-4000 or by visiting UNHWildcats.com. - At 6:15 of the first period, senior Chris Miller (Windham, N.H.) sent a shot from outside the faceoff circle that ricocheted off the post, keeping the score tied 0-0. - After the first 20 minutes, both teams were 0-1 on the power-play. The Wildcats posted seven shots on net while the Huskies had 16. - At 1:09 of the second period, sophomore Charlie Kelleher (Longmeadow, Mass.) put the Wildcats on the board during the power play after a rebound from senior Ara Nazarian (Boxford, Mass.) ricocheted to Kelleher, who buried it from the slot. - Only six seconds later, junior Brendan van Riemsdyk (Middletown, N.J.) gave UNH a 2-0 lead when sophomore Patrick Grasso (Ankeny, Iowa) gave a give-and-go pass from the faceoff circle and van Riemsdyk blasted a wrist shot into the upper stick side of the net. - At 4:36 of the second period, the Wildcats scored their third straight goal after freshman Angus Crookshank (North Vancouver, British Columbia) sent the puck across the ice to junior Liam Blackburn (Prince George, British Columbia) who tapped a one-timer into the net from just outside the crease. - After the second period, UNH tallied 11 shots on goal while UConn had 12. The Wildcats made 12 saves and the Huskies recorded eight, while UNH went 1-2 on the power-play and UConn went 0-2. - At 6:28 of third period the Wildcats increased their lead to 4-0 after Crookshank took a spin-around wrist shot in the middle of the slot that went through the legs of Adam Huska. The goal was assisted by Miller. - Grasso scored for the Wildcats at 10:14 of the third period for UNH's fifth straight goal as he slammed a one-timer into the upper glove-side of the net from the bottom of the faceoff circle. Nazarian tallied an assist on the goal. - At 17:10 of the third period, UNH made the score 6-0 when sophomore Joe Sacco (Reading, Mass.) drilled a one-timer into the upper glove side from the bottom of the faceoff circle off of a pass from senior Frankie Cefalu (Buffalo, N.Y.). - Robinson made 36 saves to improve to 8-6-7 on the season, while Huska posted 24. - UConn outshot UNH by a 36-31 margin. - The Wildcats went 2-5 on the power play and the Huskies went 0-4. - This win for UNH is the first victory and shutout over UConn since a 2-0 win on March 7, 2015. The Huskies had been 6-0-1 against UNH in the last seven games before tonight. - The Wildcats are now 7-1-3 over the last 11 games played. UNH has outscored the opposition 43-26. - The Wildcats are now 4-1-2 over the last seven Hockey East games. - Robinson now has three career shutouts and posted 36 saves tonight for a career best. - Blackburn extended his point-streak to 15 games with a goal. He has nine goals and 12 assists for 21 points over this stretch. - Kelleher extended his point streak to four games with a goal at tonight's game. He has one goal and three assists for four points. - Crookshank has 19 points over the last 15 games. He has recorded eight goals and 11 assists for 19 points over this span. - Freshman Will MacKinnon (Plymouth, Mich.) had a career-best two assists tonight. - A season-best 13 different Wildcats posted at least one point in tonight's game.